E Smith Box, Inc.- Custom Corrugated Boxes, Shipping Boxes, Moving Boxes. 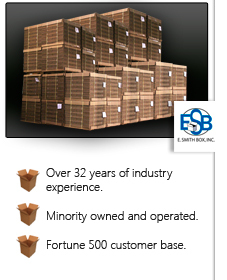 E Smith Box, Inc. is at the forefront of the packaging industry, utilizing state-of-the-art technology and business trends to produce and deliver premium corrugated shipping containers, pads, point of purchase displays and wood-related packaging. counted on ESB to keep their organizations running smoothly. Our industry experience, top-of-the-line products, technological capabilities and commitment to personal service separate us from other packaging manufacturers. As a dynamic company, we are always updating our outlook, our technology, and our business processes so that we can offer our customers superior products and service.